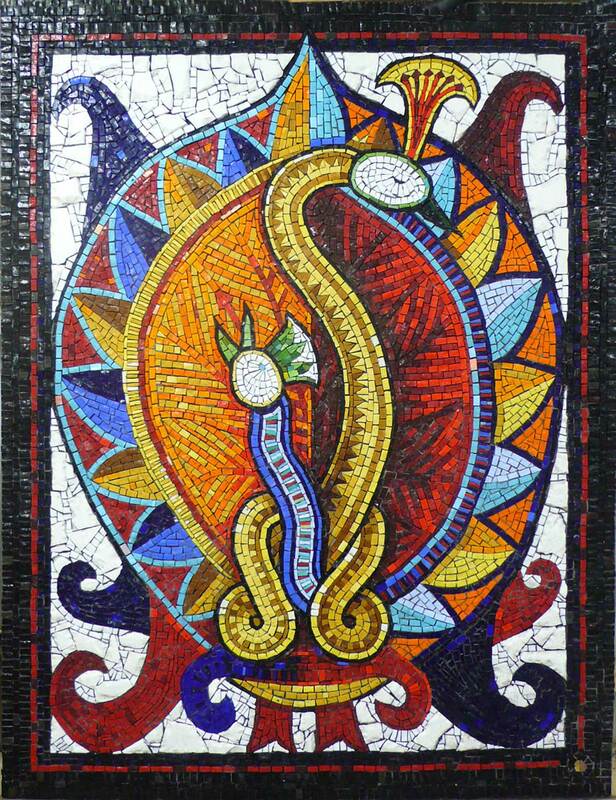 The Bharunda Bird mosaic was inspired by the Indian tale of the two headed bird whose head argue and fall out. The work was carried out using hand made Venetian glass smalti, the Rolls Royce of mosaic materials, rich in colour and texture which adds to the vibrancy of the mythological Indian bird. Venetian smalti is the same glass material that adorns the great Byzantine church mosaics of Europe and is made by just a couple of small family workshops in and around the Venice area. The design was commissioned for a residence in London, UK and was first used in a mural for the Great Ormond Street Children’s Hospital, also painted by Gary many years earlier. The mosaic sits in a steel frame which is bolted to the wall enabling the owner to take the mosaic with them should they choose to move.